Astoria? Little Miss Muffet nursery rhyme is "a story" about a girl eating curds and whey. It didnt cost a dime. "10 cents". cent = 1. 10-1-s = 101 S.
Take highway 101 S to Tillamook near Haystack Rock and visit the Tillamook Cheese Factory which provides free samples of squeeky cheese curds to tourists. "Cy Donleg" = "side on leg"? "side on leg" sounds like putting a "_" on a "|", to make an "L" shape. All you need is a hypotenuse and you have a right-triangle. Trying 1=first letter, 2=second letter, etc. CASSIOPEIZ, I see that's one letter off from being CASSIOPEIA. Does DLDFIMHUGE mean anything? Maybe this is one letter off of somethng as well. Anagram of DLDFIM could be MIDDLF or MIDDLE + HUGE. Cassiopeia the constellation is the figure of the goddess sitting in a chair. Maybe this puzzle has something to do with a seat of some kind. A saddle? take the word 'apple', rotate the p's and you get d's. Maybe apple is "addle", a partical word clue for "saddle". 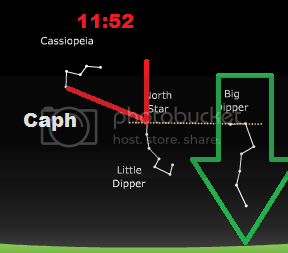 I have the idea that the stars could be used to navigate in a specific direction based on Caph being at the 11:52 position relative to Polaris and then seeing where the handle of the Big Dipper points nearest the horizon. Maybe this Cassiopeia part goes along with the section about a car having two headlights. Discarding the two dimmest stars of the referenced constellation, I believe this means there are two bright stars at a level position, horizontally parallel like the lights of a car. Hmm...perhaps that is the Big Dipper. Of the four stars forming the Big Dipper's head or cup, it's Merak and Dubhe that are most bright, pointing to Polaris. In my visual aid previous, with Caph of Cassiopeia in the 11:52 position, Merak and Dubhe are horizontal like the headlights of a car. Well if IV was Oklahoma, you'd have it. As Three Dog Night said " In Oklahoma, not Arizona. What does it matter?" Hi Domino! This hunt looks fun. Yet another decades old distraction.